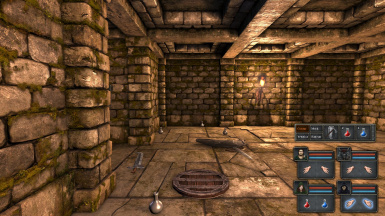 Add a \'Quick Action Bar\' to your dungeon to give your players an optional quick bar that they can use to switch their weapons with the first two items in their inventory, drink a health potion or drink an energy potion. The user can press ',' at any time to toggle the quickbar and '.' at any point to reset the position of the quick bar (incase it gets lost under the portraits). 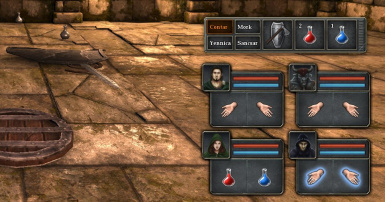 The user can select an active champion from the 4 champion buttons on the left of the quick bar. 1. Pressing the sword/shield button will swap the items in the champion's hands with whatever is in the first and second slot in the character's inventory. 2. Pressing the healing potion button will consume a potion in ANY character's inventory (but not in sacks/chests) and applies it to the selected character. 3. Pressing the energy potion button will consume a potion in ANY character's inventory (but not in sacks/chests) and applies it to the selected character. The user can click on the right hand side of the panel and move it anywhere on the screen. The user can perform any of the above functions using the following hotkeys: i,o,k,l to select characters and 8,9,0 to activate any of the three buttons. The README file contains instructions on installing this in your own mod. It only takes 3 steps and has been streamlined to be easy. 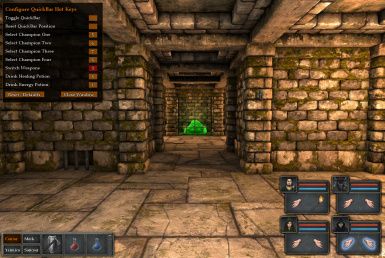 There are a few things you can customise in the script, such as the hot key bindings and how much health a health potion should give you (in case you are not using standard health potion values - note that the quick bar cannot actually 'use' the potions in the game, it emulates it by turning it into a flask, making a drink sound and altering the player stats).